The golf course was designed by Jay Moorish and architect David Druzisky. The course is named for the Sleeping Dragon rock formation sitting above it. Since opening in 2000, the course has won numerous accolades, including being voted the #1 Golf Course of Las Vegas in 2002 by Nevada Business Journal and Best Upscale Golf Course in 2004 according to Vegas Golfer Magazine. DragonFidge has hosted both the Tiger Woods Foundation’s Tiger Jam III and IV and Wendy’s 3 Tour Challenge. It’s a great golf experience in a community that Rich MacDonald describes as “the ultimate upscale community” in the area. Lots here begin at $1 million and go to $6 million dollars, while luxury homes start at $1.4 million. The focus is on homes of unequaled quality, not quantity. “Rather than focus on trying to increase density, we increase quality and charge more for it – larger lots positioned to capture the exceptional views and take advantage of the topography. That’s what we believe our buyer wants, and our success bears that out,” says Rich MacDonald. Some homes have now been carefully set along the course, but the natural beauty of the area and the wildlife within it remain at the heart of this development that enhances, rather than detracts from, its natural beauty. 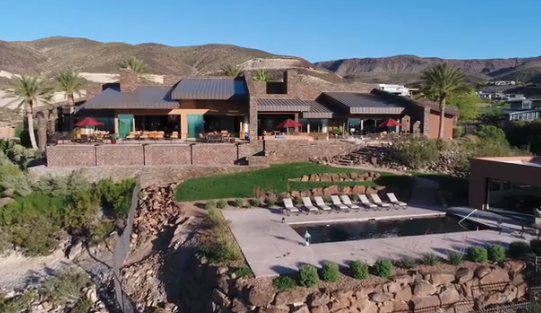 The design of the clubhouse, for example, includes stone buttresses that mirror the lines of ridges and draws its color palette from the hills and rocks, so the building seems almost a natural part of the landscape. It is just one example of the developer’s attention to detail and to nature itself. With opportunities of stunning views of the Las Vegas Strip and greater valley, a privatized and safe community to raise a family or settle in without worry of security. MacDonald Highlands is simply the best in all amenities. To learn more about our prestigious community where people experience “Life at the Top,” visit our website or call Kristen Routh-Silberman today at 702-614-9100.